The old Norse pagans believed that the universe originated at the juncture of Nifhelm, the realm of ice, and Muspell, the realm of fire. When fire met ice in the great chasm called Ginnungagap, the universe sparked into being. The cosmogony of my novel was not nearly so dramatic. I got the very first inklings when I was living on a lake in frozen Michigan, winter 1996, and my mother sent me my grandfather’s memoir. All my life, my mother had been telling me stories about our Icelandic relatives and ancestors. I listened, but I didn’t feel it was part of my identity in any way. To a kid growing up on Long Island, Iceland seemed impossibly remote, maybe even unreal. Now she was trying again. Perhaps she sensed an opening: in my snowbound cottage, I was a captive audience. My grandfather’s memoir told about emigrating from Iceland in 1876 after a devastating volcanic eruption and landing in the “New Iceland” colony on Lake Winnipeg. I couldn’t help but admit to my mother that it was completely fascinating. And just like that, I was transformed into this kind of nutty Icelandophile. 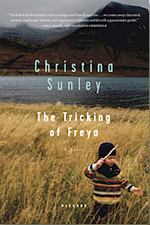 After several years, all that stuff – the Norse myths, volcanic eruption, midnight sun, medieval sagas, immigrant tales, ancient poems, family history – began to percolate into a novel. This could be a cautionary tale. Or a source of inspiration. Your choice. I didn’t know what I was doing; I kept changing my mind about whether to write in the first, second or third person; I was writing about far away places and had to do a lot of research; for a long time I had two narrators, one of whose story covered a thousand years; I developed a repetitive stress injury from trying to work full time in the software industry while writing a book on the side; I attempted to use voice recognition software to write a novel with a lot of Icelandic words (don’t try this at home); I had surgery on my arm; my lover of six years left me out of the blue; my mother – who inspired the novel, without whom I would never have even started the novel – died out of the blue; I fell in love with someone new… I’ll stop there, on a good note, a rhyme even. A lot of people flounder around for a couple of years with a first novel, then tuck it away in a drawer and start anew using everything they’ve learned and write a really strong second book that gets published and is called their first novel. It’s a perfectly reasonable and practical approach, but it was never an option for me. There was no way I could abandon Freya. I was like a dog with a bone, nothing in the world could have pried that messy novel-to-be out of my hands or mind or heart. Instead I took everything I figured out in the early years, about point of view and story and how to keep writing no matter what, and plowed it all back into the same book. Everyone keeps asking if you’re finished yet. Of course if I’d known at the outset that it was definitely going to take eight years, I probably never would have started. Luckily we can’t cheat life by peeking into our futures. But if you’re thinking about giving up (on your novel or any other life dream) – please, consider persevering. So here I am, five weeks away from the launch of my book on that auspicious date of 03/03/09. I’ve managed to make it this far without getting too worked up. For the past few months I’ve been in a kind of blissful, ain’t life grand frame of mind: I’m healthy, I’m in love, I’ve got a book coming out. What more could I ask for? Lucky, lucky me. And then about 2 weeks ago, I started getting… revved up. Suddenly it’s hard to think of anything but my book coming out. Ever. Even while I’m sleeping. I’m starting to feel a bit like Birdie, a character in my novel who has a tendency to speed up and get talky. Except in my case, it’s getting thinky. If you could pull a live feed from my brain, it would contain a mishmashed jittery jumble of big ideas (for my next book), little ideas (what about adding a third reading in Seattle? ), imaginings (standing in front of my friends at the launch party and tearfully thanking them for believing in me), fears (what if I get a bad review? ), regrets (wishing my parents were alive to see this), reality checks (is this actually happening?) and occasional serene moments (ah, it is happening, at last). All within the space of three seconds. My first novel, The Tricking of Freya, is about to be published. I have no idea what it’s fate will be, or what it will be like to have my first book come into this world. It’s utterly thrilling and also a bit terrifying. I’m going to blog about it, in case anyone wants to come along for the ride. I call it “confessions” because I want to keep it honest. Also, I like the tawdry sound of it. I’m going to capture what it feels like to walk into a bookstore and see my book on display for the first time. Or stand up in front of a bunch of strangers in a far away city and read out loud from its pages. Read the reviews, connect with readers, who knows what else? I certainly don’t. I’ve never done any of this before. And, as we count down the days to the launch date (03/03/09; I’m not much on numerology, but doesn’t that sound lucky? ), I’ll fill you in on the backstory of writing my novel, finding an agent and a publisher, and anticipating publication. So please, come along for the ride. And do speak up. I’m listening.